Authentic Shotokan karate, jiu jitsu, and more are taught at this premier location and dojo. Instructors are traditionally trained and qualified, bringing experiences from local regional, national, and international training, seminars, camps, and tournament competitions. They work well with children, youth, adults, and senior adults, as well. Check our website ShotokanKarateDojo.com for more information. 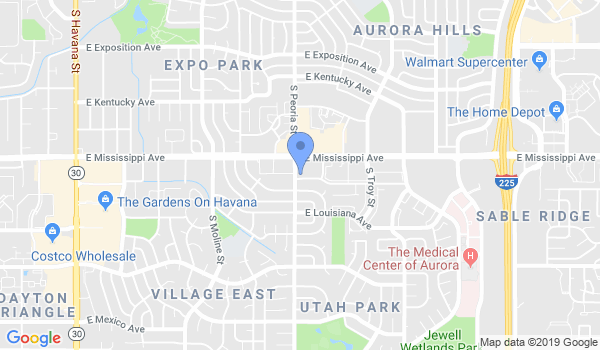 Located adjacent to the Safeway parking lot by the intersection of Mississippi Ave & Peoria St.
Programs Offered to Children and Adults: Shotokan Karate, Jiu Jitsu, Fitness Karate Jutsu, Yoga, Security Training & Self-Defense. For current schedule, check our website ShotokanKarateDojo.com . For further questions, call 303-323-8862. Would you like more information on hours, classes and programs available at Shotokan Karate Dojo? Please contact the school with your questions. Update the details, Write a Review or Report Error of Shotokan Karate Dojo. View all Dojo in Aurora or in Zip code 80012. This Chart shows the Martial Arts Styles offered most in Aurora , Colorado area. View a list of Dojo in Aurora , or enter your address below to find schools closest to you.